Coach Les Miles, the oft-maligned and ridiculed “Mad Hatter,” has returned as LSU’s coach, spurning his alma mater Michigan and one of the most storied football programs of all-time, and I for one couldn’t be happier. Before I get into my reasons, however, I feel the need to give a little background on the The Southeastern Conference (SEC) to my readers who, like the Accidental Cajun, did not grow up worshipping at the altar of SEC football. Anyone who knows anything knows that from August until usually sometime in January church actually occurs on Saturday for those who cheer for SEC teams. Sometimes prayers are granted, and sometimes not, but a rapt congregation attends without fail. The SEC is the single best football conference in the country, without fail, year in and year out. They get the best, biggest, fastest and most NFL-ready players in the country. They pay coaches like the NFL does. They have ex-NFL coaches coaching. The stadiums hold in excess of 90,000 fans. They have live animals as mascots, including LSU’s “Mike the Tiger,” a 900 pound beast that has a habitat the size of my parents house and is too uncooperative to take to most games. The rivalries are fierce and ingrained, and those who cross enemy lines are dead to their old fan base. Ask Nick Saban, the former and much revered coach at LSU who came back into the SEC to coach the hated Alabama Crimson Tide. Now LSU fans, who loved him with a passion bordering on the fanatical, wouldn’t piss on him if he were on fire. It is that intense. SEC tailgates are legendary, starting in the early morning hours and lasting all day. Because of the stifling southern heat, night games are preferred, giving fans ample time to indulge in elaborate spreads of food and drink. LSU, in particular, is known to have among the best tailgates in the country, with all the usual stuff as well as cajun delicacies. I thought I knew something about college football before I started living and loving with a Louisiana girl, but I was wrong. My Boston College Jesuit education and Doug Flutie Orange Bowl lore prepared me in no way for what I was getting into when I started to root for LSU. The intense rivalries, nail-biting finishes, and strange coaching decisions were as new and fascinating to me as a Times Square to a tourist from the midwest… quite frankly I had never experienced anything like it. Which brings me back to Les Miles, and oddly enough, Nick Saban. Les Miles, depending on whom you ask, is either the luckiest or unluckiest sonuvabitch in the entire world. Known as the “Mad Hatter,” Miles seems to have a knack for winning in the most unconventional ways possible. If you listen to his supporters, his .784 winning percentage says it all. He finds a way to win. Often hair-raising, replete with trick plays, strange clock management, and odd substitutions, but a winner nonetheless. He has had multiple 11 win seasons and a national championship in 2007. If you listen to his detractors, they point to many of the same things. He is a poor manager of the clock. He wins with dumb luck. They also point out that while Miles is an excellent recruiter of talent, he develops it poorly. More than anything, though, Les Miles had the fortune or misfortune, if you will, to follow Nick Saban as the coach of the LSU Tigers. Saban was arguably the most loved coach LSU ever had. He restored winning ways and brought a long sought after national title. His departure is still a sore spot for LSU fans years later, and he is the standard Miles is constantly held up against. The tag most frequently heard, especially in regards to the 2007 National Title, is that Miles did it with Saban’s players. This spector of Saban, who despite a .750 winning percentage and one national title that compares less favorably with Miles’ .784 and one national title, has haunted Miles for his entire career at LSU. And Miles is not totally blameless for the attitude many fans have towards him. His poor clock management and curious decisions have cost LSU games and have been fodder for College Gameday on ESPN. His nonchalant style in a conference where Nick Saban, Steve Spurrier and Urban Meyer stalk the sidelines like pro coaches seems out of sync. He has been seen eating grass on the sidelines, and is known more for his quirks than his coaching. And despite his success, when the Michigan job opened up there were a large contingent of LSU fans who never embraced him that were praying that he would take the job; I for one was not among them. I like Les Miles. It is easy to look at a season, or a decision here or there, and find fault. It isn’t as easy, however, to see the big picture, to look at a body of work. In some ways. LSU fans are like Yankees fans, demanding and expecting the ultimate success year in and year out. They don’t consider the talent on the field, only the standards of the past, and think any failure must be the fault of the coaches or the AD. In my mind, the fact that Les Miles coaxed an 11-2 record this past season out of a team that essentially played without a quarterback for about eight of those eleven wins is astounding. It wasn’t always pretty, but as Bill Parcells says, “You are what your record says you are.” Sometimes he did it in the time tested manner, with power football, and other times he just made stuff up. The bottom line is that he is a winner. He believed in his players, called the risky plays because he believed they could do it, and has the loyalty to prove it. 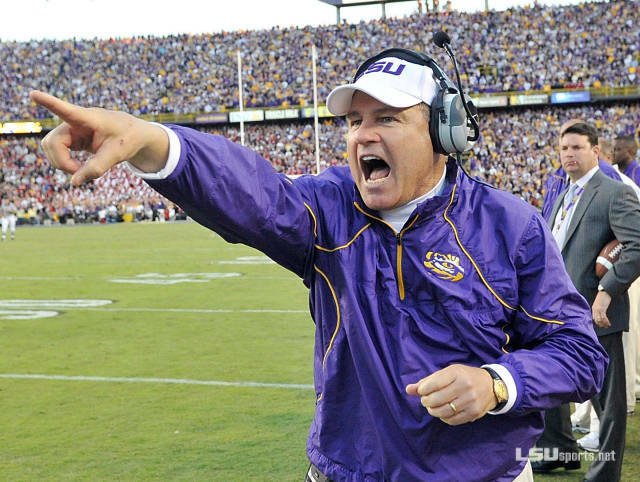 You want the sign of a good coach, it is loyalty, and Les Miles’ players love him. They defended him all year and would run through a wall for him. The importance of that can’t be understated. Nor can his body of work, which in six seasons at LSU has included a BCS Championship, a 12 win season and three 11 win seasons. I challenge you to find an SEC coach not named Urban Meyer who has been more successful in that time span. In a year where Jim Harbaugh left for the pros after his best season at Standford, how can you not like a guy who says, “the want and need to stand by your commitments to the team that I coach and the school that I represent really overshadowed any other consideration,” despite the fact that more money was probably awaiting him in Michigan. How can you not like a guy who has adopted your state and your people, saying, “My wife and children and myself really love being in Louisiana. This is home to us.” Furthermore, how can you not like a guy with a sense of humor. When asked about the vote in his son’s 6th grade class as to whether her should stay or go, Miles smiled and said “They voted to keep me. The vote was 14 to 12.” In an era when college sports is more pro-like every year, Miles is a breath of fresh air. He exudes joy on the sidelines. Moreover, he runs a clean program. LSU will never be investigated as long as Les Miles is coach, and will never have a BCS Championship vacated. I wish I could pull you away from the SEC and LSU, but it’s tough to argue that SEC isn’t the best conference. I’ll always be Penn State loyal though!